The following testimonials have been either posted on Google, WhatClinic.com or received via our patient feedback questionnaire. Our patient questionnaire is periodically e-mailed to customers who have been treated by us. Apart from a range of questions asking them to rate the service we provide, we also invite submission of testimonials which are then copied to this page along with the submitter's initals, if provided. I am thrilled with my results and have so much more confidence in smiling. Shiralee has been so amazing and I couldn't recommend having the Invisalign treatment here enough. I am very pleased with the treatment received. From initial consultation to the final phase of treatment, Dr Patel has kept me informed of the process, listened to my concerns and modified my plan to give me the smile I asked for. Most importantly, I'm very happy with the end result and can't stop smiling. I had a tooth with significant decay that was giving me pain and hearing problems and visited this dentist as they had good reviews and were close to where I work. I had previously thought I would only visit the dentist if I actually had problems - 13 years later the time had come and the dentist Shiralee did a fantastic job in putting me at ease and filling my tooth, which I had thought would need to be removed. The pain and hearing problems dissipated over the subsequent days and I went back over the subsequent weeks to have 3 other fillings in teeth that exhibited decay, as well as a visit to the in-house hygienist. Shiralee and her assistant Lauren did a super job each time, my teeth look and feel much better now compared to before and the experience has convinced me that I need to change my ways and go to the dentist regularly - I was lazy / apathetic before but now I see the merits and would fully recommend this dental practice! I have been with group for over close to 2 years. The balance of quality care and excellent customer service scores very highly with me. As someone pushing fifty who had not looked after their teeth and gums I have fond them considerate and helpful in organizing a treatment plan to bring what was very poor gums back to recovery. For the work I have had done the costs were manageable but more importantly I am a very satisfied customer. I highly recommend All Clear! Over the years I have seen many dentists a few good ones but most bad, but let me explain bad. I have a gagging problem which makes me very nervous of dentists and most I have found tended to get impatient which made things worse. My dentist now is Dr Shiralee Patel who made me feel at ease from the beginning explaining everything so well and allowed me to ask questions that most dentists don.t like wasting their time on. I still gag but she says have a breather to recover and never have I felt her getting impatient. Her work on my teeth has also been of an extremely high standard thus I cannot fault her. Anita and her assistant were so professional from initial consultation to treatment. No hard sell, just advice on what could be done cosmetic wise. I'm not a nervous patient, but Anita and her assistant ensured I was comfortable at all times and they seem to have that knack at putting people at ease. Highly recommend! I am absolutely pleased to meet them and I consulted them for my 6 year old son and I found their prices very reasonable. The dentist answered to all my questions and queries and all my worries about my child’s dental problems are vanished after meeting her. I found Anita to be very gentle, friendly and professional in her approach. I would have no hesitation in recommending allclear to a nervous patient. I always have a positive experience at this dentist, simply because they treat you as an individual. I was a nervous patient and never really went to the dentist unless I had to but since I have been coming here (3 years now) I have never had that dreading feeling about drills etc. I would recommend this dentist to friends and family always! I have been a patient for 3 years. The practice was recommended by a friend & it certainly is the best dental care in Croydon. I can highly recommend them. I've always been a bit fearful and put off going to see the dentists for as long as possible.All clear staff are very friendly and approachable and it's this great service that would make me recommend them to anyone looking for dental treatment. Very friendly and informative. Makes a nervous patient like me feel at ease. I had a broken bridge and was able to see the dentist as an emergency case. The service was excellent . I was able to go to work feeling confident with the service done to my teeth. My family is now ready to change their dentist. I will recommend AllClear. Excellent service. Very kind, reassuring and professional. Throughly recommended. My experience with All Clear has been excellent.The staff are all professional at what they do and as long as my dentist is there I will not be changing dentist. Great friendly place with a reception area that puts you at ease. Very happy with the service obtained. excellent service and have recommended to others. Always very clean and tidy also very kind for nervous people. I had not been to the dentist for 20 years after developing a phobia as a child stemming from some very painful treatment. An infection forced me back to be met and treated by Anita. The treatment was gentle and caring and I can now say I am no longer scared of the denstist but am actually looking forwards to completing my treatment and having a healthy mouth again. I find the whole team helpful and polite! When a dental practice recommends a different practice you know it must be special and AllClear certainly is that. From Anita, the most thoughtful and gentle dentist that exists and her lovely husband that holds everything else together to the staff she employs, I cannot fault the service or treatment I have received and would quite happily talk to anyone considering implants and why I think that AllClear should be where they go for them. Although above all else, they are professional people of the highest caliber, I have been their patient for so long, I have come to think of them as friends. My experience at the dentist was very pleasent as the the hygienist put me at ease by breaking the barrior of authority. She was very friendly and explained the process clearly. Was very gentle and explainded what she was doing throughout to reduce any unnecessary anxiety. I really enjoyed the service that was offered to me. All my visits to this surgery have been successful and the treatment was excellent. I would highly recommened this surgery. I have had excellent service and treatment so far, it's still ongoing and I am very pleased with the results. It is comforting for me to know that I can contact my dentist, at any time and receive attention of high quality.. I was treated by both the Hygienist and Dentist and the service was excellent. I have been to other Dental practice before and got out feeling soar, but it's a pleasure to get treated at AllClear. The Dentist and Hygienist are so gentle which makes visiting the dentist a pleasure! I have recommened AllClear to several people as the standard of service they provide is exemplary. Lovely service from Anita and her colleagues over the last couple of years that I've been a patient of All Clear. She's done a couple of repairs including root canal and a crown for me that have worked really well. I called her "gentle fingers" because she never hurt! Thanks. Anita has been my dentist for a few years now.I have never had a dentist like her, she is suberb.She is very approachable.She is polite. She is extremely gentle. she is calm and very professional,and what tops it all she is very hygienic. With Anita I feel very safe. My first encounter with AllClear was very pleasant , I would recommend it to friends and family. The staff was extremely polite. I don't really like the dentist, however I am looking forward to the next appointment to because I felt comfortable. I would recommend this practise. I had a dental implant procedure and found the quality of work was very high and each stage of the treatment was thoroughly explained. Anita treated me and I found her able to deliver the best quality work I have had so far in my history of dental treatment. I was really pleased with my treatment at Allclear. I have always been seen on time, the staff are friendly and approachable, and Dr. Anita is the best! Excellent, friendly, honest and trustworthy service. Great value for money too. Thanks All Clear! I am normally quite nervous when visiting the dentist, due to bad experiences with them as a child. But at All Clear I am made to feel relaxed and assured at all times. 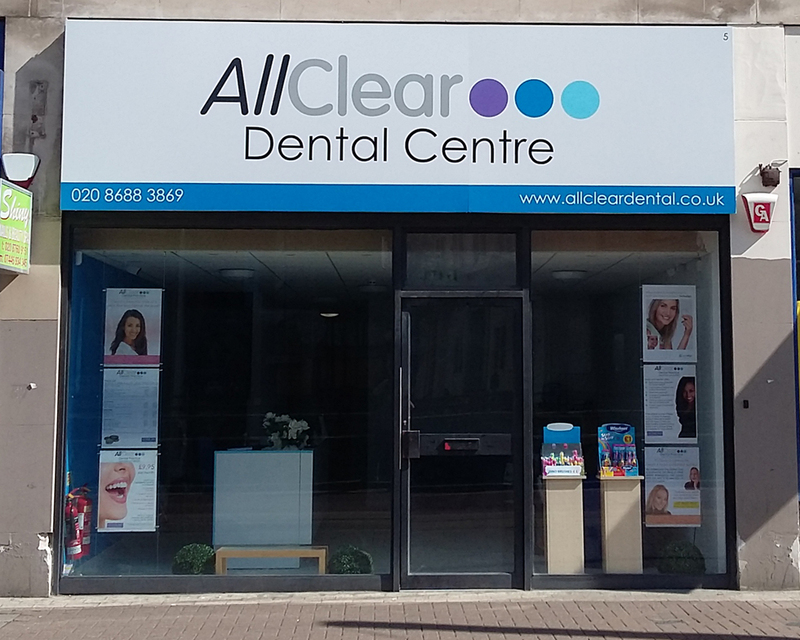 AllClear are a very good and kind family practise, I am happy to recommend them to other people, especially those who maybe a little nervous about visiting the dentist. They also offer an affordable dental plan where you can pay for your treatment on a monthly basis by direct debit. They are so much better than my previous NHS dentist! All Clear makes going to the dentist pleasant, well, as pleasant as a trip to the dentist can be. I find the treatments first class, the practice clean and staff are always friendly and willing to fix appointments around my very busy life! It is not the cheapest practice around but that reflects the standard of service you will receive and you won't regret it. I have been extremely happy with the dentist and the reception team. I requested an emergency appointment, and got one and was seen almost the moment I got there. I am a nervous patient, and was kept at ease the whole time and everything was explained to me. I am not so scared of the dentist now! Anita always makes you feel welcome, she is a great dentist and one of the reasons I have remained a customer. I have been a customer for almost 5 year and it is one of the best if not the best dentist practice I have been to. Excellent service. Clear and efficient. A very friendly yet still professional enviroment that puts you at ease the moment you enter the reception. The dentist Anita is absolutely at the top of her game adn checks on a regular basis as to whether you are comfortable and not in pain. If there is any discomfort she gives you a brief rest then tries to accertain the cause and then does her utmost to aleviate the problem. Since becoming a patient of Anitas my teeth are 100% improved both cosmetically and comfortable, this is something I haven't had in a long while . Most of all both Nigel and Anita make you feel valued and treat you with the utmost respect this is why I would not hesitate to recommend anyone looking for a top Dentist who treats your mouth like a work of art and is meticulous in everything she does to improve your smile which adds to your confidence and overall dental health. A very friendly practice, always willing to go the extra mile to help. Anita Cryer is an excellent dentist, very thorough, and most important her treatment is pain-free! I would recommend the practice to anyone. Great service, I was able to make an initial appointment, have a check-up, filling and hygienist within a few days which really suits me. A very flexible and professional practice. Anita is excellent - very gentle and didn't need an injection. Excellent customer care, attention paid to customers needs first, welcoming environment and thought out payment plans which benefit the client and comparable to NHS. I found all the staff in the practice extremely friendly. I am quite nervous of the dentist but I was put at ease by both the dentist and hygienist. I would most definitely recommend this practice to anybody looking for a new dentist. Anita and her staff are absolutely fantastic. I went to her with a very traumatic situation (tooth loss at 36!) and she made me feel totally at ease and safe. I'm not scared of the dentist but was very disturbed by the procedure I needed to have (all through my own fault) and she was amazing. In charge. Gentle. Caring and sensible without being patronising. Everyone was brilliant. Sympathetic without being patronising but at the same time very caring and honest. I have already recommended friends and will continue to do so. Brilliant. Well done. Very professional and courteous. Knowledgeable and very clear explanations given regarding follow up treatments and continuing care. Have been attending All Clear since they opened, and am 1 of the first customers! From check-up through stages of treatment (crown fitting and tooth extraction), I received excellent care and attention, with almost painless procedures and excellent end result. Cannot praise dentist enough. The practice is professional and the treatment affordable. Anita is a very caring dentist, always making patients feel "at ease". I can relax during treatment, knowing that all my needs will be met and that the final result will be as near to perfection as humanly possible. Staff are friendly, polite and put you at ease. I have been going to AllClear for some time now and am always happy with my treatment. Any questions are fully answered and the staff on the desk are also helpful. All treatments are explained in laymans terms step by step, also the costs involved in the treatments are discussed so there are no surprises at the end of it! I have always been happy with the hygienist and the helpful explanations to enable me to look after my teeth better. I will continue to go to AllClear for all my dental needs. The treatment I have received at AllClear over several years now has been consistently excellent. My dentist, Anita, is welcoming, friendly, and totally professional. She performs the routine examinations very gently and with an unhurried thoroughness that is very reassuring. Follow up treatments have been performed in the same caring way, and the results have been always been excellent. I am very glad that I have found this dental practise. I have come to have total confidence in them and great respect for the expertise and care with which treatments are performed, and I have strongly recommended them to all my friends. Great service. Very pleased over the past year with my implant and the follow-up treatment. I would recommend to all. The service I receive from this practice is always excellent, I say this because having attended several Dentists in the past there is no comparision. I have a jaw problem and this Dentist always ensure I am comfortable and works around my problem. I was a nervous patient before coming here but no longer dread the Dentist, thanks to this team and Anita (Dentist). I also like the fact that they open on a Saturday and will see you in emergency so can fit treatment around work commitments. The cost of treatment is very reasonable too and the monthly options is very affordable. All members of staff were polite, friendly and very professional. The people at AllClear are exceptionally friendly and professional. You won't be disappointed. An excellent service with clear focus on patient care and value for money. The services and treatment that I received at All Clear was very very very good. All the staff that I dealt with from; the drop in to enquire, to the telephone appointment, to the cancellation and rebooking and the actual treatment was very good to the point of excellent. My Dentist was wonderful and show edvery good physician qualities. Kind understanding, empathy and very very good knowledge of what was being done. The fee structure was clear and to the point. I will reccommend All Clear to any friend/family. Very Good All Clear!!!!. No messing about! Excellent staff and services. Anita is the best dentist I have come across and with their fix prices I know what I am paying for. I wish I had found Anita 10 years ago she is so kind she knew how nervous I was and has done everything in her power to help me return to going to the dentist at regular intervals.. Going to the dentist is not my favourite thing, but at AllClear I find the saff to be very friendly, which for me is important. thorough and at the same time very professional. A thorough and cost effective dental practice. The staff are always polite and courteous - explain the treatment and the costs involved. I have never had any issues with the treatment or service received at the practice. I would not hesitate to recommend Allclear. The service is excellent and the staff are very friendly and polite. The treatment is first class. The service provided by Allclear is outstanding, the premises are very pleasant , the entire staff are very helpful and friendly which makes a trip to the dentist a pleasurable experience. I have reccomended them to a lot of my friends.. Highly recommended. Pleasant and courteous service at all times. I've always enjoyed my time at the dentist, very friendly and helpful people. Thanks for all your help. it is great to find a local dentist who provides great treatment at reasonable prices. I am not a nervous patient but my partner is. He has not been to a dentist for over 17 years. He described his experience as 'brilliant' and yes he did have some treatment. I have already recommended AllClear to a friend and he is really pleased with his experience too. The treatment at Allclear has been excellent on all my visits. The staff are polite and helpful and the dentist puts all her effort into making you feel relaxed and ensuring you receive the most appropriate treatment applicable to you. The dentist is very experienced and caring, so you feel you can totally trust her. 1st class service, prompt and polite , have already recommended others to come. The Staff are friendly, I have not yet been kept waiting pass my appointment time, all treatment is explained in full & unlike other dentist I have been to; I have never felt like I have been pushed into unnecessary treatment. I would recommend. Excellent service at an excellent price, highly recommended. Very friendly and helpful staff, overall as pleasant an experience as a visit to the dentist can be! I've finally found a dentist where I feel comfortable and at ease. What a lovely dentist.I felt really special.You know how sometimes you feel the dentist is not really listening to you? Well not there. Anita made me feel at ease from the start and all the treatment I had was top quality. Worth every penny!I highly recommend it. AllClear is by far the best dental practice I have used and as long as I live in this area I will keep using this practice. Anita and her staff are personable and take the time to get to know their customers. I have a personal dislike of all anesthetic and the sickly effect is has on me. Anita has been totally sympathetic and performed a number of treatments with care and attention without trying to force injections upon me. My experience of AllClear is totally different to past experience of dentists. I've been signed up to this dentist for a couple of years now. Previously I had avoided the dentist for over 13 years due to a fear of the dentist chair and bad treatment as a kid. I've had a couple of fillings and even two wisdom teeth removed, and I am happy to report that I no longer fear the chair! The surgery is very modern and the dentist is very professional; she has a great knack of relaxing even a nervous patient like me! I first started using this practice as it was local to my job in croydon, I have since left that job but I still travel 25 miles for my checkups as I know I'll get a service I can trust. I would definitely recommend! Went here as an emergency one Sat morning. Was really impressed with the treatment and indeed the dentist herself. She was really effecient and reassuring. She fixed my broken crown in no time at all. A missing front tooth is not a good look! IIf I didnt already have a really lovely dentist (which closes at weekends) I would definetly join this practice.